The flood to end all floods, the once in a century, flood was supposed to have been the one that hit Calgary and Southern Alberta in 2005. Another flood was not due back in these parts for a quite while, but on June 20, 2013 a once-in-a-lifetime flood stopped Southern Alberta in its tracks, devastating the towns of High River and Bragg Creek, submerging many areas within the City of Calgary, the native communities of Morley and the Siksika reserve and several other parts of Southern Alberta. Two and a half weeks after the floods started the extent of the devastation is just really beginning to sink in now and the efforts required to rectify the damage done to individuals, and to communities, is still enormous. The rains started on Wednesday, June 19 and just kept falling. Not those tiny little springtime raindrops but the big fat summer raindrops that soak you to the bone and keep on coming. Our Couch to 5k running group was cancelled at lunchtime on Thursday because the rain really had not stopped. Towards the end of the day some people were talking about the flooding in Canmore and High River. 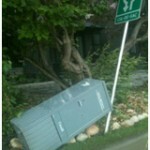 This was my first indication that the rains were not the ordinary Alberta June rains. I am working late that evening at a World Refugee Day event and as I drove out of the parking lot to head downtown, I heard the news that parts of Calgary close to the Bow River were being evacuated. In fact the CBC was reporting that the area where one of my colleagues lives, in Inglewood, very close to the Bow, was being evacuated. I thought it was just a precaution and that nothing would come of it. But the rain kept falling and big fat, dark moisture laden clouds sat over the city as I drove up 8th St SE and across the 9th Ave SW bridge where I could see the water in the river below starting to rise and flow over the banks onto the bike path below. I parked on 4th street near the Salvation Army, not really thinking about the evacuations as I headed towards the downtown Calgary Public Library, arriving just as the event was starting. At the beginning of the event, the head librarian informed us where the emergency exits were as a precaution and I filed that information in the back of my mind as one after the other, the performers and speakers came on stage. An hour into the performances, the head librarian came on stage, interrupting the MLA, a refugee from Vietnam, who was recounting his experiences. We were told that Chinatown was being evacuated, and because it was very close by, as a precaution, we were being asked to leave the Library so that we would have time to get home safely in case downtown was evacuated. As I left the building, heading through the side exit and down the stairs to street level, with speakers, participants, performers and staff streaming out of the building, the imminent floods became a reality for me. As I walked past the C-Train stop and the Municipal building, down the street towards the spot where I had parked my car, a young woman approached me. She asked to borrow my phone as her battery had just died and she had been separated from her sister during the evacuation. She made a brief call, turning around to say ‘oh there you are. I can see you’ just before she rang off, handing the phone back to me. She was so happy and thanked me profusely. “God, bless you” she said with an ear-to-ear smile, before heading off in the direction of her sister. It felt good to have been able to help her even in such a small way. I continued towards my car, noting as I approached the parking lot that men with duffle bags were standing in the rain which had petered off to a drizzle, outside of the Salvation Army, many heading into the streets with their loads on their shoulders. “Where do you go when you are homeless and they evacuate you from the homeless shelter?” I asked myself as I watched the men filing out of the Sally Ann, one of them passing my car commented that he thought it was the city of Calgary opening the gates of the reservoir that was causing the flooding. My next task was to find a safe route home! I did not know the city too well and did not want to end up on the wrong road, in a low lying area now that lots of areas of the city close to the river were being evacuated and I had to cross over the river to get home. 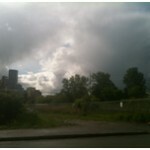 I live is on high ground in the NW part of the city close to the Nose Hill Park so there was no risk of flooding there. As I made my way across town, luckily without incident, I drove across the 14th street bridge and could see that the water was pretty high and flowing very quickly. I realized how totally unprepared I was for any type of flooding. No one told me that I would need hip-waders when I moved to Calgary!! [which was in fact cancelled], but also because I would have love to have been able to do something to help with the emergency!! In retrospect, after seeing video footage of the flooding, I know that those first days were a time for the Emergency First Responders. Not only were the police, firefighters and city crews working around the clock evacuating people from their houses, condos and apartments, but the City of Edmonton and places further afield sent volunteers to assist with disaster mitigation – building burms to keep the water from flooding over the banks in places where that was possible, closing roads and bridges and going door to door in affected areas to ensure that residents had been evacuated. It was a spectacularly coordinated event of gargantuan proportions. Sensei Thankachen, of Oku Damashi Dojo in Langdon, took some incredible photos of the flooding downtown, [flooded roads downtown, Chinatown submerged and water covering the lower level of the centre street bridge] when she went into the city to assist evacuate a friend. I have included her photos here. Late that afternoon the rains stopped. 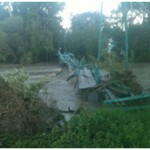 Many roads, and almost every bridge across the Bow and Elbow rivers, were closed. I had been listening to CBC radio, every hour on the hour during the day as they broadcast from a makeshift studio in the South Alberta Institute of Technology [SAIT], strung together with microphones and duct tape as one broadcaster pointed out. 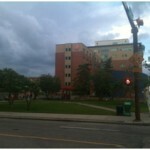 The CBC studio is on Memorial drive just North of the river and had been evacuated. The broadcaster for the early morning show was on the air most of the day as many of his colleagues could not make it in to work. Once the rain stopped I headed out to the grocery store, to stock up as I had not been shopping in over a week. I also wanted to buy some supplies for the Drop In Centre, one of the local homeless shelters that had been forced evacuate early in the morning and had bussed their residents to an old hotel they used as a treatment site. There was no water to be found anywhere in the grocery store. The mayor had announced that the water supply was safe but that water conservation was necessary but obviously people were taking precautions. That evening was the first of several evenings volunteering at the Drop In Centre. Donations were coming in by the droves. Myself, and several volunteers, formed a long congo-line and spent the first part of the evening moving perishable grocery donations out to a refrigerated truck before returning to clear a large downstairs room of bedding and blanket donations so that sleeping spaces could be set up for the residents. It was close to 9:30pm when I left for the evening. The next morning the Mayor was still asking people to stay out of downtown, which was flooded, and to stay away from the rivers and bridges. Many roads were still closed, emergency crews were all over the city. I went back to the Drop In Centre, keeping my mind off the niggling feeling of helplessness one feels when Mother Nature flexes her muscle. The news was saying that the flood had been caused by record snowfalls and unprecedented rainfall. There was no mention of climate change or the possible effect of the super close, super moon, but one really has to wonder how much of a role they played. As always, disaster brought people together. There was a strong sense of community developing among the volunteers at the Drop In Centre’s temporary location. We mostly did not know each other, but despite that everyone was working together to receive donations, heft boxes, sort toiletries, clothes and bedding, sort underwear and roll socks for the displaced homeless people of Calgary. Later that evening, hearing that floodwaters were receding in certain areas and people were being let back into their homes I went out to have a look around the city. Police cars blocked the exits from Crowchild Trail to several low-lying roads along the river. 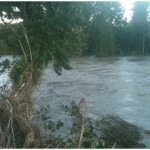 The Bow was much wider and fast flowing than I had ever seen it. I drove to the CMAC Kurama Yama dojo, which is on high ground and was unaffected by the floods. [The Langdon dojo – Oku Damashi -- was also luckily spared from the flooding]. I headed through that community taking a route I sometimes use to go from the dojo to one of my favourite parks. This route takes me very close to a tributary of the Elbow River, which runs through a very beautiful riverfront neighbourhood. The flood damage was extensive and devastating. On the radio that day I heard that the damage to one of the power substation in down town Calgary was substantial and that it may be offline for weeks, if not longer. Emergency crews from the power companies were racing to save another power substation. 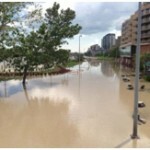 As the waters in Calgary receded in some areas and the City was still under a state of emergency, some neighbourhoods were being allowed back into their homes and people were starting the arduous process of clean up while others were simply getting on with their lives. More of the clean up efforts to come!